Great customer service begins with making life simple for our customers. We all desire for both our personal and professional life to be as simple as possible. I like to use the analogy of Walmart and how they make your life simple. They are a good place to shop because you can purchase such a wide variety of products under one roof. They have greeters that welcomes you to the store and tell you goodbye as you are leaving. Another great example for me is Chic-fil-A. I have yet to visit a Chic-fil-A and didn't get a superior meal and excellent customer service. They always respond with, "My pleasure" and a smile. In my humble opinion, Chic-Fil-A is a benchmark for superior customer service. When I'm traveling and want to stop for lunch, I will seek out a Chic-fil-A because of the excellent customer service they offer. Kudos to Chic-Fil-A for a great product and excellent customer service!! If customers are the lifeblood of a business and excellent customer service is what attracts and enables a company to maintain customers, than why doesn't everyone provide excellent customer service? The reality is, excellent customer service cost nothing but it is worth a fortune. The reason not all companies get "it" and do "it" well is their culture isn't geared towards doing it well. The culture of a company starts from the top-down and everyone within the company must see the leaders practice excellent customer service. This is seen daily in our company because the two owners are actively involved and have been for 40 years. They had to build our company from the ground floor up and they built it on a philosophy of going beyond our customer's expectations. We have come a long way over the course of 40 years. Achieving ISO & AS certifications, Parker Seal & Parker Chomerics distribution and an expanded fabrication department are many of the advancements made over the course of our companies' history. Another key to excellent customer service is knowing the products you sell well and being able to assist your customer with their applications. 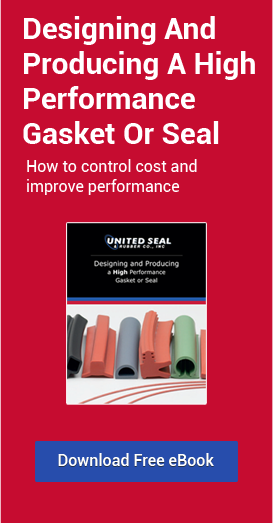 United Seal & Rubber knows seals and gaskets and we know them very well. Beside our owners having 40 years or more experience, our sales team has an average of 20.3 years of experience in our industry. Our customers can expect technical support from our staff. We are not a seal & gasket distributor-fabricator who just sells products but needs the manufacturer to support us regarding technical concerns. If you haven't given us a try, we welcome the opportunity to add your company to our customer list. If you are an existing customer, we want to thank you for your support and business! !